Ron's Piano Service and Warehouse is an authorized dealer for Broadmann, Taylor, Knabe, Samick, Kohler and Campbell, Hallet & Davis, Hobart M. Cable, Falcone, George Steck and more. 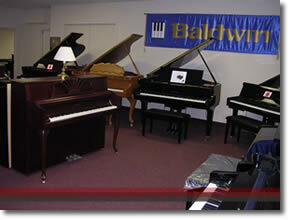 We carry a diverse selection of pre-owned Yamaha, Kawai, Baldwin, Steinway, Wurlitzer and other brands. Choose from concert grands to baby grands, full-size uprights, studio uprights, consoles, spinets and digital pianos. We also do consignments. If you are having trouble selling your piano, let us deal with the hassle of selling it for you. We will put it on our sales floor and website and sell it for a small fee. If you are thinking about buying a used piano from a private party, it is best to have the piano appraised to confirm that all of the components are in good working condition. If not, you could run the risk of having major problems that could be costly to repair. Call for additional details on appraisals. Ron's Piano Service is owned by Ron Panuska, a professional musician, teacher and piano technician. Ron has serviced many major accounts from Caesar's Palace in Las Vegas, Nevada to the Lyric Theater in Baltimore, Maryland. He also services and tunes pianos at local churches, schools, country clubs, and private parties. Ron has been in the piano business for over 40 years and is a second generation musician and technician. When you meet with Ron, you will find a more relaxed atmosphere than what you would find at other, high-pressure piano stores. Ron proudly places its reputation behind each piano it sells and services.